Demetri Martin hits it on the head. It’s funny because it’s true. Or is it sad because it’s true? Commercials fall into two camps for me. On one hand, I enjoy the creativity of a good commercial. 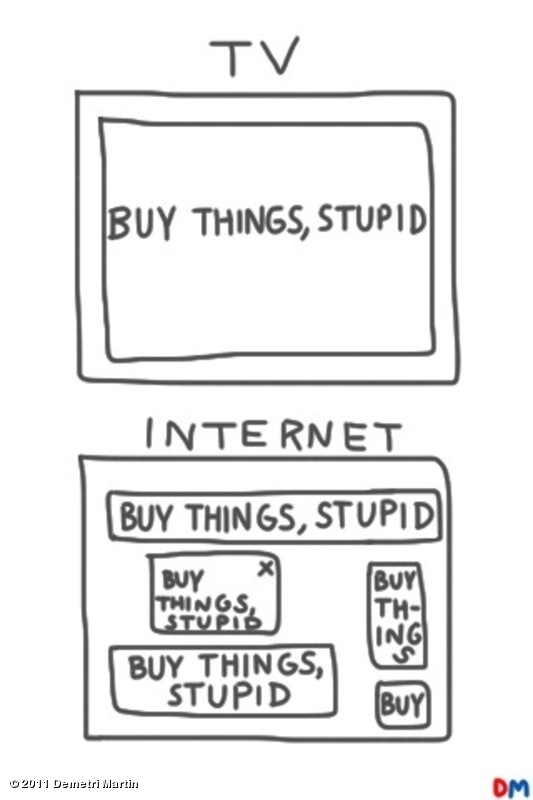 On the other hand, commercials make me want to buy stuff I don’t need. But when I read that economist Juliet Schor estimates that for every hour of TV a person watches each week, they will increase annual spending by about $200, I don’t seem to like commercials so much. With the average person watching nearly five hours of TV a day, that’s close to $7,000 a year. I wish I were making this up. That’s a pretty good raise for just about anyone and can be had just by cutting out the advertisements and artificial lifestyles we see on television. We’re less likely to keep up with the Joneses if we don’t know what the Joneses have. Have you tried going TV-free? What’s your take on this? If you agree or disagree, sound off below. This entry was posted on Wednesday, June 15th, 2011 at 3:20 PM	and posted in Uncategorized. You can follow any responses to this entry through the RSS 2.0 feed.